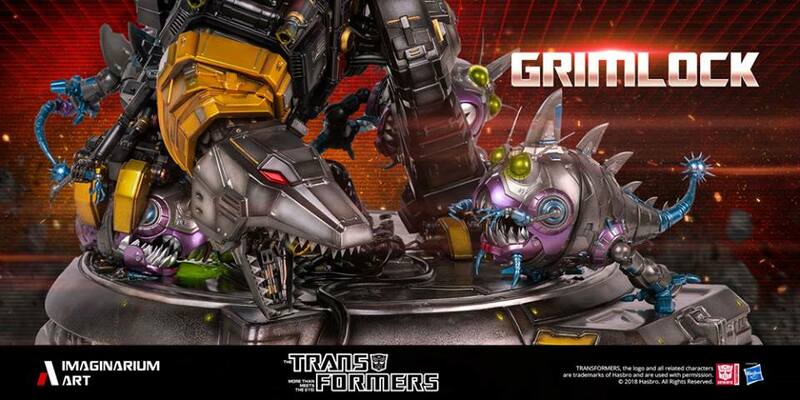 Imaginarium Art Facebook has shared color images of their upcoming Grimlock Statue which also includes Wheelie and some Sharkticons. 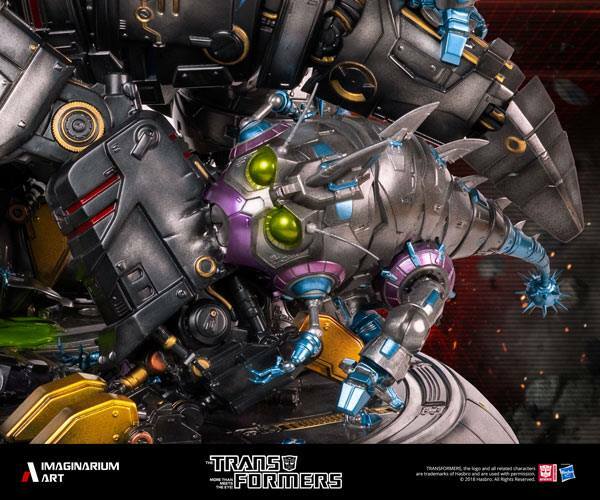 These new images show the intended look of the complete statue, which features Wheelie riding on the back of Grimlock, fighting off 3 Sharkticons (one of them in robot mode). 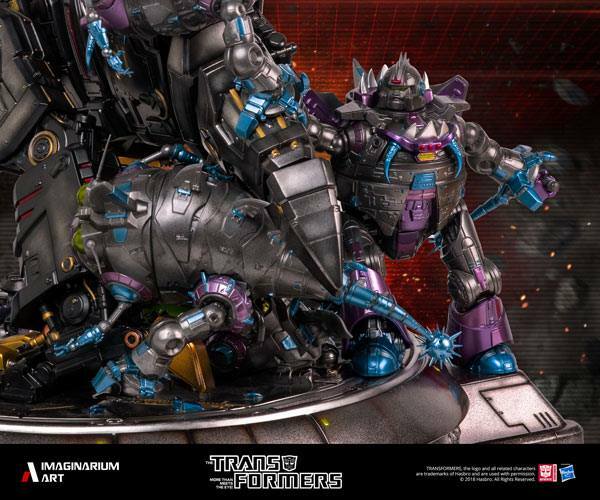 This makes total of 5 characters on this statue (or six is you count the poor crushed Sharkticon below Grimlock’s foot) all of them with amazing finishing and details. 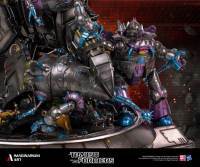 According to the information shared by Imaginarium Art, pre-orders for this item will start on September, 10th. You can check out the images after the jump and then sound off your impressions on the 2005 Boards! Normally they do Better pricing than this but I agree, $500 over retail is terribly disgraceful. Exquisite. Like all the other TF G1 statues from IA. Only one single flaw! Grimlock does not have red optics in G1…but otherwise, this is G1 perfection. Grimlock Battle scene up for Preorder! There are 7 characters (1 damaged Shark) in this diorama. I may have just found for what I’m going to ask for Christmas. Very nice, but it seems like Wheelie's colours got messed up somewhere down the line. Just compare them to that "concept art"
Bring me not into temptation, and resist delivery of this evil…. I MEAN GORGEOUS STATUE HOLY GUACAMOLE BATMAN! My only critique is that I think the brow of the head looks too low. 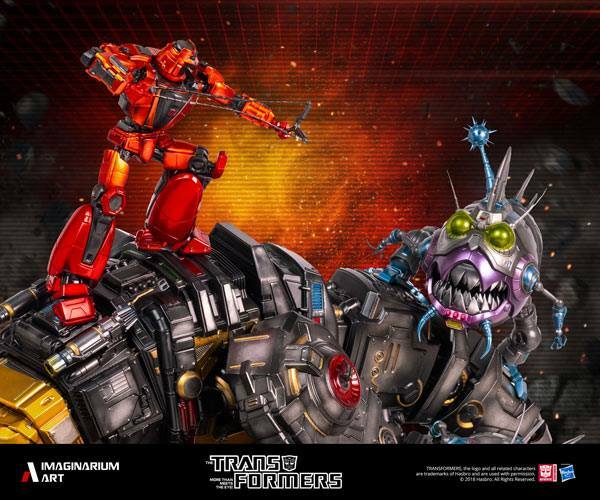 Head looks more alligator-like instead of Grimlock. Minor nitpick. Not sure if you're aware, but that's basically the point of the entire Transformers franchise, GI Joe, the MCU, Star Wars… you name it. Have you seen Spaceballs? There's a specific scene there I think you should watch. Pretty much outlines the entire business plan. This is gonna be huge, it will include Wheelie! All in one! Good movie it was yes but as a lot of people on YouTube who review this fan of transformers or not they say animated is great big animated movie commercial to show off new character toys to buy,. I don't really do statues but that's epic!! I love action scenes like that and very well done! !